The pop-up bazaar will take cues from the original Silk Road. You may already be familiar with immersive dining experience Project Botanicals. The pop-up bar and restaurant brings the aromatic botanicals of gin to the limelight through inventive food and drink matches. The ginstromony event is back for its third run in 2017, this time with a new name and more laid-back format. Led by Bombay Sapphire, the newly coined Botanical Bazaar will take cues from the bustling markets of the original Silk Road, all while showcasing the versatility of gin beyond commonplace unions like tonic and juice. Running for five nights (1 – 5 November) at Fresh Factory in Eden Terrace, the event will feature five food and cocktail stalls curated by Bombay spirits ambassador Chase Bickerton and Jamie Johnston (aka Sauce Boss) of contemporary Chinese eatery Judge Bao. 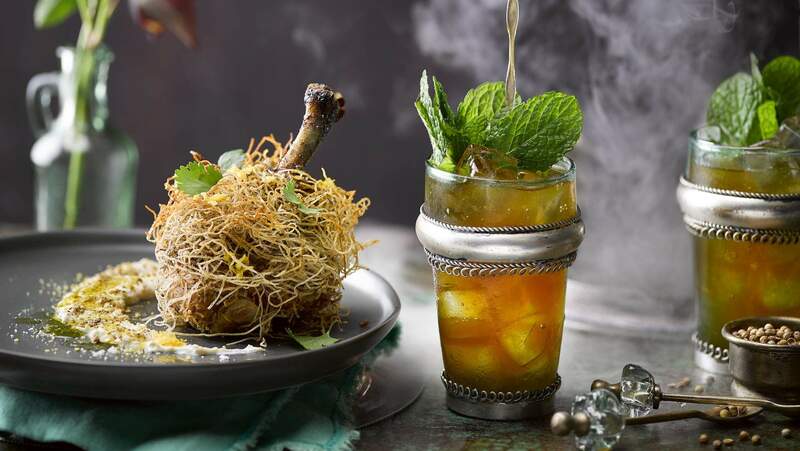 The stalls will be influenced by the flavours of Spain, Italy, Germany, China and Morocco — countries where Bombay Sapphire sources some of its ten botanicals. Pairings will include the Moroccan-influenced Sunset Sapphire Tea with dry ice, matched with harrisa roasted chicken; a spin on the traditional gin and tonic that includes a carrot rose; and a Germany-inspired bier concoction that comes paired with a bratwurst, pretzel and sauerkraut burger. All the dishes have been designed by Johnston to eat in the hand. Each session will see approximately 200 guests gather to create the atmosphere of a bustling Middle Eastern bazaar. The sensory journey will come full circle with music from Auckland DJs. The Botanical Bazaar will take place at Fresh Factory, Eden Terrace from Wednesday 1 November to Sunday 5 November. Tickets are $45 and include two food and two drink tokens. Further tokens can be bought in advance or on the night.